Fire Check Door Blanks for Safety & Security. 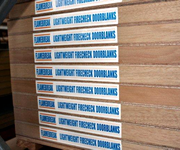 Avon Plywood Ltd at Keynsham, Bristol stocks Fire Check Door Blanks which being manufactured with solid timber cores may be recut to size with out reducing the structural integrity. Choice of two thicknesses: -. Suitable Fire Rated doorframes and doorstops must be used together with intumescent and or smoke seals if applicable in order to comply with regulations. It is also recommended that an appropriate hardwood lipping be applied to the four edges to completely seal them against the elements when installing as an exterior access door. These doors are suitable for paint finishing.